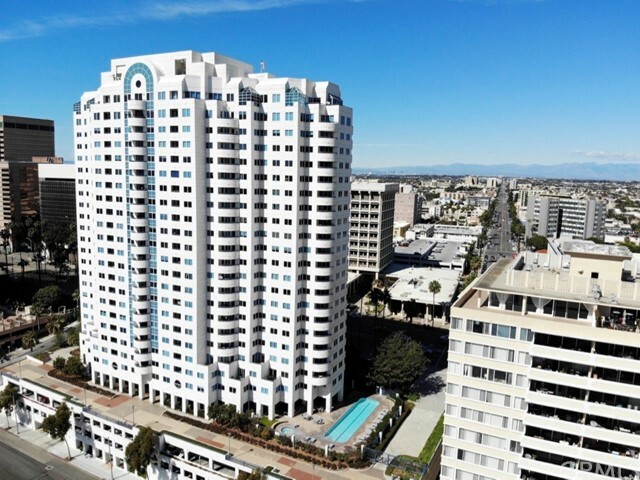 One of the best ocean views in the heart of lively DTLB! This elegant move-in ready condo offers astonishing views of the Pacific Ocean as well as some of the most famous landmarks of Long Beach. Landmarks such as the historic ocean liner, Queen Mary, the Wyland Whaling Wall located at the Long Beach Arena, the marina and the colorful Grissom island. Being on a corner unit, it also offers views of the city. The two spacious balconies are perfect for enjoying the view, the wonderful So Cal weather and some of the most fun & sought after events in town, such as the Long Beach Grand Prix. The interior upgrades include granite counter tops, upgraded cabinets, dual glass vessel (bowl) sinks in the master bath, jetted jacuzzi tub in the master bath, claw-foot tub in the 2nd bath, built-in desk and cabinets in the 2nd bedroom. The condo has plenty of closet and storage space including a walk-in closet in each bedroom. The building (Harbor Place Tower) is one of the best high-rises in the area with wonderful amenities and staff. Amenities such as lap pool, spa, sauna, fitness center (with ocean view and TV), package acceptance, 80 guest parking spaces, 24 hour security guard and surveillance system. The location is walker's paradise. The beach, restaurants, coffee shops, stores, the famous Pine Ave, The Pike Outlet, The Long Beach Performing Arts Center and all the fun events of DTLB are just steps away.